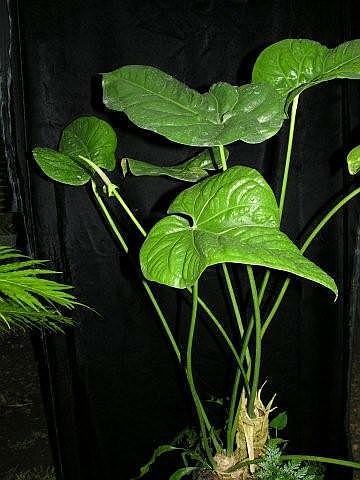 Aroid Forum: Does this Anthurium look familiar? Does this Anthurium look familiar? I need a little ID help. I bought this Anthurium at a local nursery some time ago with the tag labeled 'Anthurium rzedowskii'. The nursery had it out in bright light and it was really suffering with scorched blades and dry conditions. It took years to bring it back, but now it seems happier. It has been a very slow grower only producing a few new blades each year. It seems to like moister conditions and lower light. I'm not sure if it was labeled correctly and was wondering if anyone could tell me if they have this in their collection and if the name is correct, or what the name might be. It is unlike any other Anthurium we have, specially with it's fibrous trunk. Also, the way the petioles do not brake off easily when the blades grow old and fade, but must be cut to be removed. I bought this plant from Tropiflora years ago that was tagged as A. Back then, I also asked on this list for help in identifying this plant. nursery was unable to provide any helpful details on this plant's origin. hope to come across another to add to my collection. > I need a little ID help. > conditions and lower light. > correct, or what the name might be. > blades grow old and fade, but must be cut to be removed. I have not seen this plant before. Obviously it is not A.
could just purchase it would contemplate trying to collect. to recognize it and thus detect where it originates. 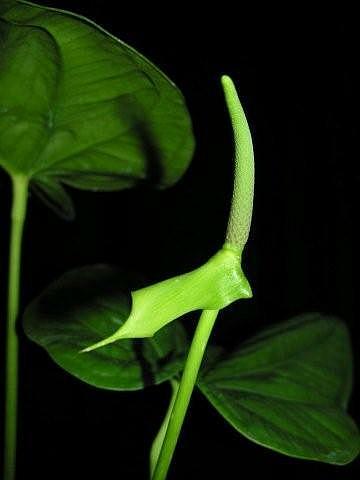 Subject: Re: [Aroid-l] Does this Anthurium look familiar? correct, or what the name might be. blades grow old and fade, but must be cut to be removed. 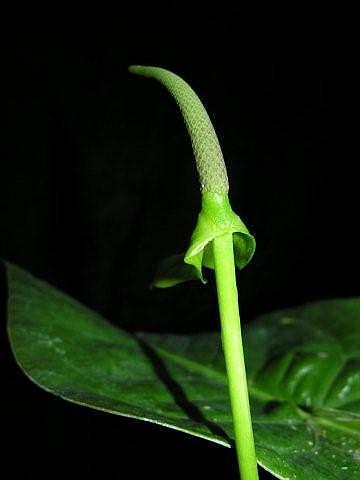 Subject: [Aroid-l] Does this Anthurium look familiar? Dave Fell at Hawaiian Sunshine in Hawaii was selling seedlings of A.
something else in his collection. Dear colleagues, Please send a photo for me to help. > ???????? ??? I responded to you about this earlier today based on a forward.? As I said then please send images of inflorescences when you see them.? Now I am wondering if this might not be a strange Anthurium sect. Urospadix since I don?t recognize this as anything from the western Andes. ?I am hoping that Marcus Nadruz sees this and might know it. > Subject: [Aroid-l] Does this Anthurium look familiar? > I need a little ID help.?? > I bought this Anthurium at a local nursery?some time ago with the tag labeled 'Anthurium rzedowskii'.? > The nursery had it out in bright light and it was really suffering with scorched blades and dry conditions.? It took years to bring it back, but now it seems happier.? It has been a very slow grower only producing a few new blades each year.? It seems to like moister conditions and lower light. > I'm not sure if it was labeled correctly and was wondering if anyone could tell me if they have this in their collection and if the name is correct, or what the name might be. 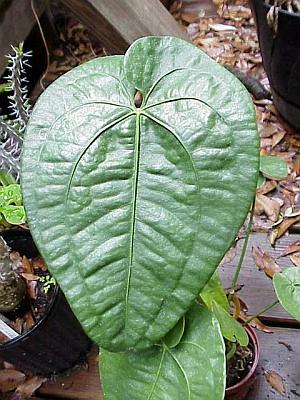 > It is unlike any other Anthurium we have, specially?with?it's?fibrous trunk.? Also, the way the petioles?do not brake off easily when the blades?grow old and fade, but?must be cut to be removed. The photo is in th ID Center. > I responded to you about this earlier today based on a forward. As I said then please send images of inflorescences when you see them. Now I am wondering if this might not be a strange Anthurium sect. Urospadix since I don't recognize this as anything from the western Andes. I am hoping that Marcus Nadruz sees this and might know it. > I bought this Anthurium at a local nursery some time ago with the tag labeled 'Anthurium rzedowskii'. > The nursery had it out in bright light and it was really suffering with scorched blades and dry conditions. It took years to bring it back, but now it seems happier. It has been a very slow grower only producing a few new blades each year. It seems to like moister conditions and lower light. 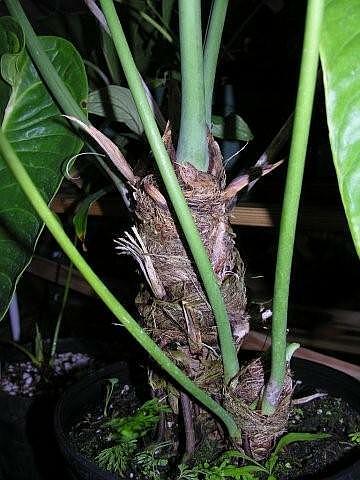 > It is unlike any other Anthurium we have, specially with it's fibrous trunk. Also, the way the petioles do not brake off easily when the blades grow old and fade, but must be cut to be removed. In my opinion this plant called A. rzedowskii does not resemble the rare Mexicana species of that name. They look more like A. jurianaum (as suggested by Marcus Nadruz), a conspicuously peltate species from Brazil. But of course it is not peltate. Perhaps it is from Brazil and perhaps a sect. 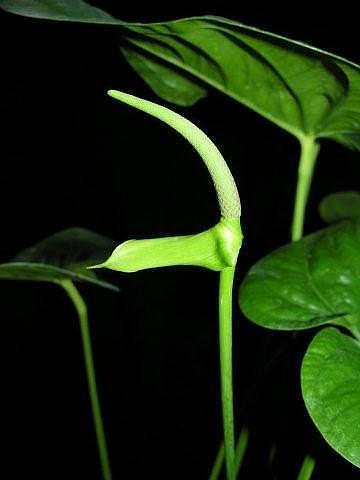 Urospadix. I hope so because it does not appear to be an Andean species. Dave Fell at Hawaiian Sunshine in Hawaii was selling seedlings of A. rzedowskii about three or four years ago. I do not know where he got his mother plants. Neverthe less...I was never able to make the plants I recieved grow out and look like anything worth growing. Kind of miss shapen and hard to grow. Perhaps they were rzedowskii that hybridized to something else in his collection. I have not seen this plant before. Obviously it is not A. rzedowskii Croat and it could be new but unfortunately we don't know anything about its origin or even if it is a real species and not a sport or a hybrid. It is a pity people market plants with no origin because their real value and no doubt price would go up if we know. I assume that they think someone will go recollect the plants but it is now nearly impossible and not one in a million who saw this plant and could just purchase it would contemplate trying to collect. If either of you manage to flower this plant please keep me abreast of data you accumulate. Perhaps with more details I may be able to recognize it and thus detect where it originates. Back then, I also asked on this list for help in identifying this plant. The only helpful response I remember was from Dewey Fisk (couldn't find it in the archives, may have been a private email) saying that this plant had appeared for sale from time to time under this name, and that they all originated directly from a grower in Hawaii. Unfortunately the nursery was unable to provide any helpful details on this plant's origin. Attached is a picture of my plant that sadly dropped dead for unknown reasons the year I purchased it. 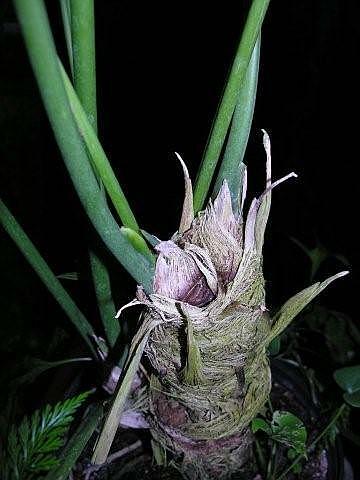 It was a very distinctive plant, with the overlapping lobes and thick bulate leaves held upward on long petioles. I have not seen this plant available anywhere since then, but hope to come across another to add to my collection. I looks like Anthurium hatschbachii, an inedit species I am describing from Southern Brazil (Paran? state). It looks pretty similar. Eduardo. Dr. Eduardo G. GoncalvesUniversidade Catolica de BrasiliaCurso de Ciencias BiologicasSala M-206, QS 7, Lote 1, EPTCCEP 72030-170, Taguatinga ? DF, BRAZIL. From: abri1973 at wp.plTo: aroid-l at gizmoworks.comDate: Sat, 2 Feb 2008 18:05:11 +0100Subject: Re: [Aroid-l] Does this Anthurium look familiar? > I responded to you about this earlier today based on a forward. As I said then please send images of inflorescences when you see them. Now I am wondering if this might not be a strange Anthurium sect. Urospadix since I don?t recognize this as anything from the western Andes. I am hoping that Marcus Nadruz sees this and might know it. > From: aroid-l-bounces at gizmoworks.com [mailto:aroid-l-bounces at gizmoworks.com] On Behalf Of Windy Aubrey > Sent: Monday, January 28, 2008 5:17 PM > To: Discussion of aroids > Subject: [Aroid-l] Does this Anthurium look familiar? > > I need a little ID help. > > I bought this Anthurium at a local nursery some time ago with the tag labeled 'Anthurium rzedowskii'. > > The nursery had it out in bright light and it was really suffering with scorched blades and dry conditions. It took years to bring it back, but now it seems happier. It has been a very slow grower only producing a few new blades each year. It seems to like moister conditions and lower light. > > I'm not sure if it was labeled correctly and was wondering if anyone could tell me if they have this in their collection and if the name is correct, or what the name might be. > > It is unlike any other Anthurium we have, specially with it's fibrous trunk. Also, the way the petioles do not brake off easily when the blades grow old and fade, but must be cut to be removed. First off I would like to thank Adam, Denis, Tom, Marcus and Eduardo for their input. I received some informative emails privately regarding this plant and I did some investigating. From this I found out, so far, that this Anthurium in question was originally in the collection of Dorothy Henkle, presumably collected in Brazil. I have learned that it is in the section Urospadix. I believe this species is currently being described. 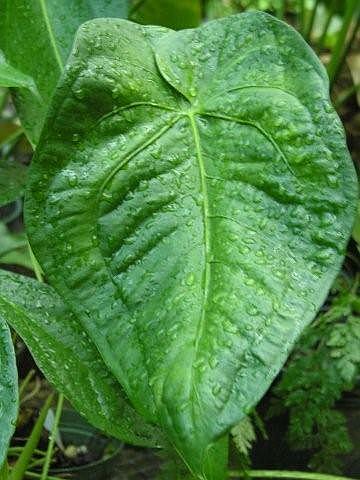 There is another species, Anthurium jureianum, in the Urospadix section that is very similar, except for it's leaf is peltate. 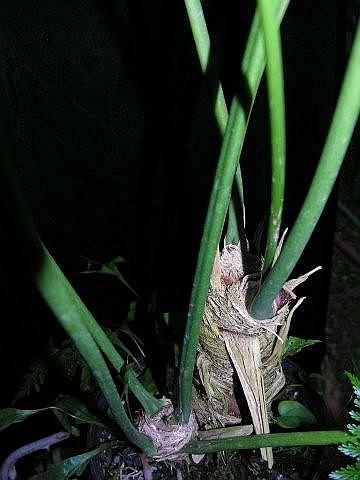 At the time I started this thread our plant did not have a spathe, but since has produced one. I have attached some additional pictures including the spathe, in hope that these images will confirm an identification.